Successfully Added Colorful LED Stage Light - 7 Colors, 3 Light Modes, Visual Wave Effect, 9 Watt, Remote Control, 3m Projection Diameter to your Shopping Cart. Add some color to your life with this magnificent LED color light. This LED light portraits a beautiful ocean wave effect on your wall or floor, making you feel as if you were at the beach. Allowing you to switch in between seven different colors and providing 3 different lighting modes, this LED water ripples light is sure to fit the likings of everybody out there. Perfect to be used at parties, bars, restaurants, or storefronts – this LED color light is sure to set the right atmosphere for any imaginable occasion. Coming with its own remote control, this LED stage light can be easily operated from afar. Letting you choose between 7 different colors, you will always be able to display a beautiful ocean effect on your floor, wall, or ceiling. Additionally, this LED color light lets you choose from 3 different lighting modes, allowing you to simply enjoy its peaceful ocean wave effect in the color of your liking or to select the automatic color change or flash feature. When the automatic color change or flash feature has been enabled, this RGB light allows you to choose from different changing speeds – ensuring that you will always be provided with stunning visuals that suit your liking to the most. 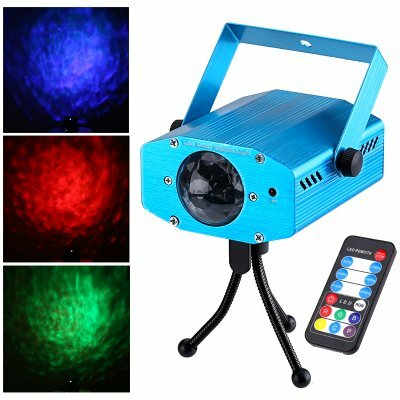 Additionally, this LED stage projector can also be commanded through voice or sound - letting you control it without the need of using its remote control. Coming with its own little hook, this RGB light can be easily attached to any surface. Place it on your ceiling or wall - all you need is a screw and you’ll be able to install this beautiful light decorator wherever you like. Featuring a projection distance of up to 5 meters and a diameter of 3 meters, this LED light is capable of creating a stunningly large ocean wave effect. Perfect to set the mood at a party, in a bar, or restaurant – this LED color light is sure to get your visitors in the right mood. Additionally, this cool 9 Watt RGB light forms a perfect asset to any storefront or restaurant entrance out there. Simply attach it to your wall and portray these stunning wave effects on the sidewalk in front of your entrance and you’ll be sure to grab the attention of people passing by. This special LED light comes with a 12 months warranty, brought to you by the leader in electronic devices as well as wholesale electronic gadgets..
Arabic: - مرحلة الصمام الخفيفة - Chinese Simplified: - LED 舞台灯 - Czech: - Světlo LED fáze - Dutch: - Stadium van de LED licht - French: - Lumière d’étape de LED - German: - LED-Bühne Licht - Hebrew: - אור LED במה - Hindi: - नेतृत्व मंच प्रकाश - Hungarian: - LED színpadi fény - Italian: - LED luce di scena - Japanese: - ステージの LED ライト - Korean: - LED 무대 조명 - Malay: - Lampu LED peringkat - Norwegian Bokmål: - LED scenen lys - Romanian: - Etapa LED Light - Russian: - Светодиодный свет - Spanish: - Luz de la etapa del LED - Thai: - ไฟเวที LED - Turkish: - LED sahne ışık - Vietnamese: - Ánh sáng LED sân khấu.